When Bomberman debuted on the Nintendo DS a couple of years back, he made a suitable debut for the system. However, Ubisoft came up short when it came to the game's single player mode, which wasn't nearly as strong as its multiplayer. Atlus, now handling the Bomberman license as far as this game is concerned, worked with Hudson to try and give a little relief for the solo player with the second Bomberman DS game, Bomberman Land Touch! The result is rather surprising - and a better game than Ubisoft's previous entry. In the single player Story Mode, players control Bomberman as he arrives on a curious island filled with pirates and other island dwellers. Players move the B-Man around the screen with the stylus. While some players might prefer the more typical D-pad controls, they actually work rather well here. As players progress around the island, they can gain access to new areas by completing individual challenges. These challenges come in the form of fun little mini-games, in the same vein as the Wario Ware games. Most of these mini-games are a blast, little tasks that have to be completed in order to grab medals or necessary components to access new areas on the island. However, there are the occasional mini-games that tend to drag on. Fortunately, the good outweigh the bad for the most part, and they're worth revisiting if you're up for earning better times. The graphics in Bomberman Land Touch! aren't exactly overwhelming. The island is presented in an isometric view, so players can get a good look at the land. However, the design seems rather simple, with very little animation or character touches to give them some distinguishing features. When you run into a character and engage in conversation, you simply see a standing-still picture of them. Hudson could've added some more detail here, I think. Also, the sound, while happily bopping along, works in simplistic terms. Oh, well, it's a Bomberman universe, we'll forgive it. Where the game earns its bombing legs is with its gameplay. The mini-games, as we mentioned, are mostly playable and quite enjoyable upon repeat visits. What really stands out here, however, is the game's Battle Mode. Here, up to eight players can take part in classic Bomberman action, launching bombs at opponents and picking up power-up items to help boost their performance. (These include explosive accelerations, roller skates, extra bombs, and more.) 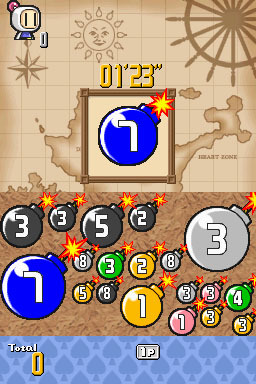 The game screen is separated into two sections, via the top and bottom screen, so there are plenty of places to set up strategic explosive patterns and traps. Gotta love the traps where you pin an opponent against a brick and they can't move. The multiplayer is better than you think. The game fully supports the Nintendo Wi-Fi Connection, giving Land Touch! a huge advantage over the previous Bomberman. Players can log on and take on opponents, and the online play works rather well. For those without access to the Internet (or, worse yet, the game), there's good news. Up to eight players can take part in a session using only one cartridge. The game also supports multiple players that have cartridges as well, so there's no option unturned. Some mini-games can be accessed for versus competition as well, in case the Battle Mode gets old. Fortunately, that hasn't happened at the Modojo offices. Bomberman Land Touch! could have been an instant classic with better emphasis on the graphics and sound. However, its extra features more than make up for the lacking effort in presentation. 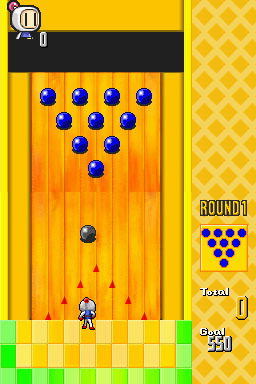 The gameplay is pure classic Bomberman in Battle Mode, and the mini-games add some variety to the single-player game to make it a more enjoyable romp this time around. The online and offline versus options are staggering - they really don't get any better than this. Bomberman has the touch - and with that, so should you. What's Hot: Superb multiplayer options with Battle Mode; most of the mini-games are fun. What's Not: Story Mode looks simpler than it should; some of the mini-games are grating.